Today, January 22, the U.S. Supreme Court issued an order denying review in Karnoski v. Trump and Doe v. Trump, two legal cases that challenged the constitutionality of President Trump’s proposed policy from 2017 barring open service for transgender Americans. By denying review, the Justices allowed the legal challenges to continue in the federal courts – but they also lifted critical injunctions blocking the ban from taking effect. 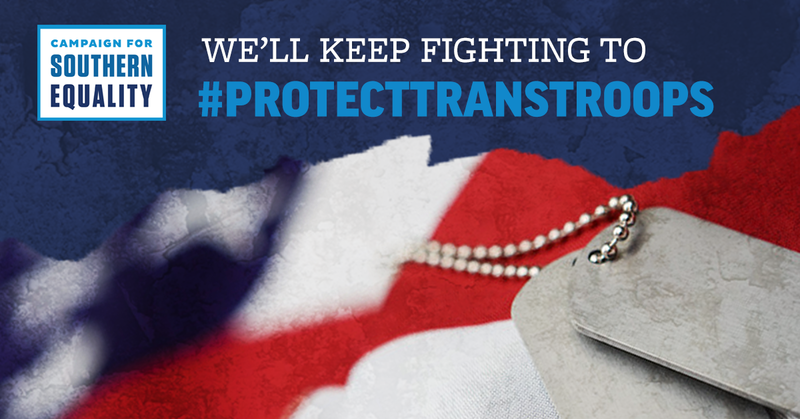 Now, as a result of this decision, transgender servicemembers could be blocked from enlisting in the United States military, and transgender service members could face cruel, unnecessary discharges. For more than a year, the proposed policy has been blocked in court and transgender Americans have been openly enlisting. Even before that, many transgender people actively serving in the military have come out as transgender. Lifting the injunctions – even temporarily – is a slap in the face of the brave service members currently serving our country and those who want to serve. But it’s not the end of the road: Several other cases are still pending in court, and we’re awaiting a ruling from the U.S. Court of Appeals for the 9th Circuit, which heard arguments on the case in December 2018. One thing is clear: This cruel attack on people serving our country who meet every other military standard will not stand. Ultimately, it will be blocked for good. Read more from Lambda Legal, the National Center for Lesbian Rights, and GLBTQ Advocates & Defenders.